This is likely the final episode I will broadcast from my parents' basement in Minneapolis, before I move to NYC and start broadcasting from the WFMU Mothership. We'll celebrate this chapter of IYLYH history by playing three hours of personal hits. On this week's episode, I forgo my usual mission to present music that I've just discovered. Instead, I'll be fighting back the panic I feel at the prospect of moving across the country by playing songs that make me feel very good. Most of these aren't all that obscure. These are the types of songs I'd listen to on my lunch break, when it's sunny outside and I am strolling to the co-op to purchase an overpriced grain bowl and I need to feel alive. Enjoy! Sheila E A Love Bizarre In Romance 1600 Paisley Park / Warner Bros.
Hi Sam and listeners! Congrats on your upcoming move. I have a buttload of fireworks and propane. No smoking, please. Howdy, ya'll! Thanks for being here. I can't promise I'll play anything you've never heard tonight, but I hope you enjoy. Closer to the mothership, Sam. It's quite difficult to lose a horse in NY. Ha ha! I stand corrected. Losing your horse is my hobby! Well, then you've come to the right place, friend! I didn't know this was a Bacharach song. Wishin you and your horse good travels! Mark, I am so happy you're here!! Folks, commenter Mark Mahoney is a member of personal radio hall of fame. Thanks, @Doc! Let's hope my horse follows me out there. What is your life long dream, Sam? Truly, @Carmichael, getting to do this show is one of life long dreams. Beyond that...your guess is as good as mine. @ngh! Glad I'm rockin' with another KDJ fan. If I were doing this show--a program informed by personal go-to tunes--I'd have to include Bacharach's own rendition of "Mexican Divorce" (the greatest pop song ever recorded), and Ry Cooder's "I Cant' Win." Ironically, Cooder's take on "Mexican Divorce" is nowhere near as good as the composer's own. Dean! Bacharach's "Mexican Divorce" is go-to Burt for me as well. I'm gonna guess that photo is late '70s. Provenance? That's right, @Dave. That's why my lunch break every day is three and a half hours, and I work from 9 am to midnight! @Dean: The caption on the photo reads, " A Miner Who Had Completed His Work Shift Is Shown on a Pony Belonging to the Family of the Tavern Operator. A Short While Later He Was Bucked Off. There Is Little for the Young Miners to Do in the Small Mining Towns Other Than Drink Beer and Talk. 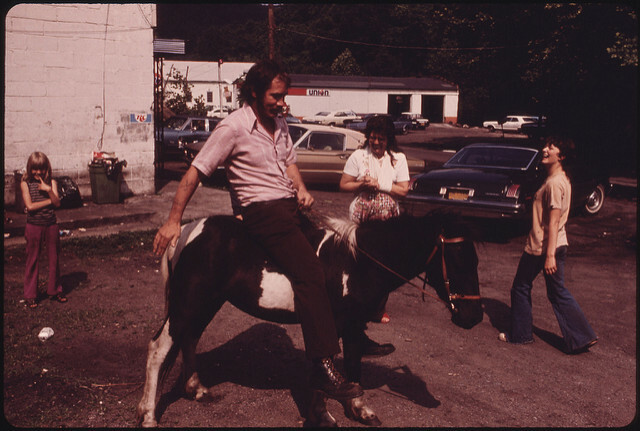 In Rhodell, West Virginia, near Beckley 06/1974." Hmmm, early/mid-70s. (I'm not good with car vintages.) I'd propose that, contrary to there being little to do, a young miner could read, play banjo, volunteer to wash windows at the local public library, wash dishes at the tavern, and work on funding a start-up transportation service that shuttles patrons from tavern to tavern. So many great grooves. Thanks! DL! Glad to have some West Coast in the house. Even before vocals, in the first second you know it's Prince. His name is Dave and he is from Vermont! Gotta move on out, enjoy the holiday, and the move! Looking for a house/apartment myself, but learning Thursday evening I got the position, means, no one has been around to answer my inquiries, and obviously won't until Wednesday. Hopefully I can find a place, and move in two weeks. It's only 60 miles from where I am now. That's excellent news, @NGH! Take it easy.